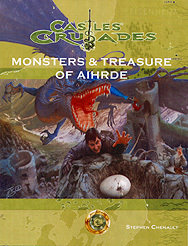 Within Monsters & Treasure of Aihrde lies a veritable host of legendary monsters for your Castles & Crusades game. Each entry comes fully detailed with descriptions, habits, treasure, combat, special abilities, details on culture where needed, as well as a special section on each monster's place in Aihrde. With over 150 monster entires and scores of new specialized maigc items this new work promises hosts of aventuring glory. Beautifully illustrated and full compatible with any home grown setting or inserted into your Aihrde campaign this monstrous tome promises epic adventure.